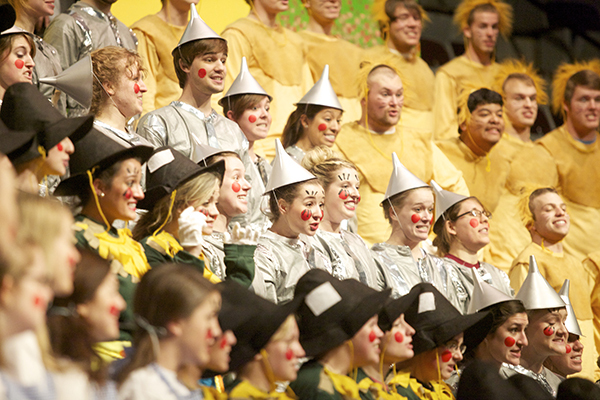 Members of the 2013 senior class perform as Scarecrow, Tin Man and Cowardly Lion. Editor’s Note: Courtney McGaha is a member of the ACU Class of 2013. In March of 2018, I visited ACU Special Collections in the basement of the Brown Library for the first time. I was just hoping to be able to find a few old, forgotten Sing Song VHS tapes or vinyl records to convert. I never expected to walk into a treasure trove of ACU and Sing Song history that filled the basement like a labyrinth and leave there after over a month having found, and digitally converted, all but one of the 62 productions of Sing Song. My relationship with Sing Song’s rich history is not a new one. As a kid, my family and I would listen to my parent’s cassette tapes from when they were students in the 1980s whenever we would go on road trips. There were a few spectacular acts from those tapes that stuck with me long after we stopped listening to them, and I considered them to be the epitome of what Sing Song was supposed to be. Then, when I was participating in my first act as a sophomore in 2011, I asked my parents to pull those tapes out so I could hear them again. I could tell that the quality of those tapes was degrading rapidly, so I converted them to mp3 to preserve them. 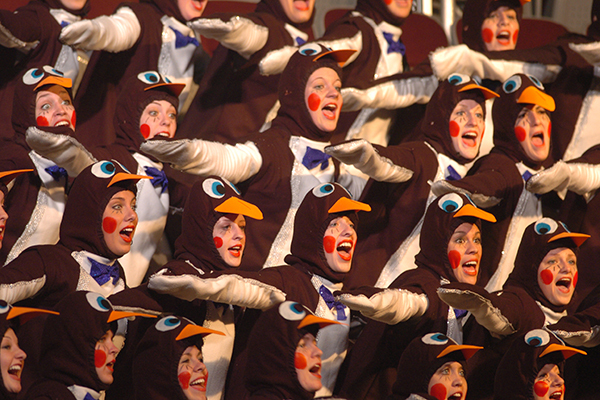 Penguins from the junior class slide down the Sing Song stage in 2006. As I once again started to fall in love with Sing Song of the past, I also become concerned that the recordings of other years were being lost to time and old age like my parent’s tapes had been. I decided to try and track down as many as I could before I graduated, and I managed to find a large number and convert them. The day I was able to finally show my parents the acts they were in as students was so special to me, and I always wished that there could be a way to do that for others as well. However, as I was only doing it for friends, family and for my own interest, I never thought I would get the opportunity to complete the collection. But earlier this year when Nick Tatum (’13), director of student productions, asked me to finish the work I had started so many years ago, I jumped at the chance to finally preserve the history I had grown to love so much. I knew the process of tracking down every year performed would be an immense challenge, but we wanted to do this for alumni, like my parents, who had memories of Sing Song that have never been able to be shared before, as well as for those students just discovering what Sing Song is. So, after spending nearly 900 hours listening to cassettes and records, watching VHS and DVDs, downloading thousands of photos, Optimist articles, Prickly Pear pages and programs, and building a website with all of these things for everyone to finally see, I completed the archives at last, and the history was preserved forever. Members of Sub-T 16 portray Cabbage Patch Dolls in 1984. It has been an honor to get to immerse myself in the history and memories that this tradition has left to the thousands and thousands of students who have participated in the past and all those who will participate from now on. I cannot wait to hear the stories that will be told and to see the joy this show has brought for the last 63 years being remembered at last. 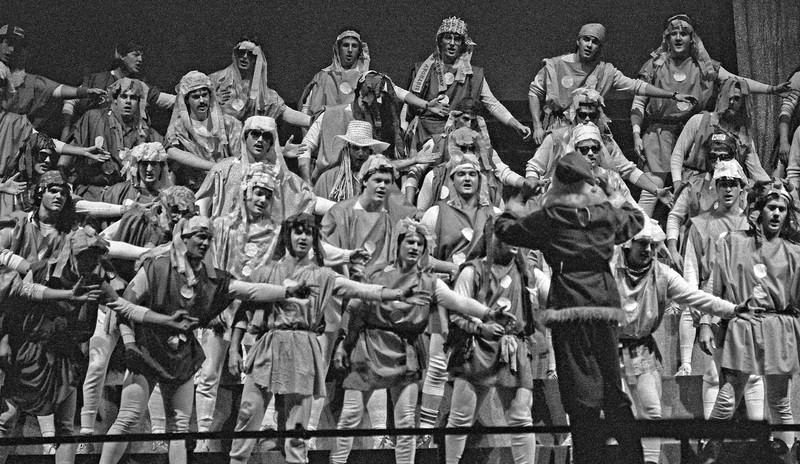 In order to connect the future of Sing Song while also honoring its roots, this year each upstage group will redo an act from before the year 2000. Each group will pick one of these past acts and one song from that act to perform, while simultaneously making the theme their own. We hope watching the old acts to prepare for the new ones will help current students feel connected to the tradition and fall in love with Sing Song’s past the same way Nick and I have. You can access these archives online for free at acustupro.com/archives. We are still actively updating the website with any new pieces of high quality audio, video and pictures we might find. So if you or someone you know has access to anything we are either missing or that may be damaged, please let us know at SingSongArchives@acu.edu. View more from Courtney McGaha.